Chocó Andino de Pichincha Biosphere Reserve is located in northern Ecuador, in the Pichincha province, north-west of the capital city of Quito. The altitude of the area ranges from 360m to 4,480m a.s.l. Its biodiversity and endemism along with that of the Amazon and Galapagos, have made Ecuador worthy of the status of biodiversity hotspot. The Chocó Andino region extends over two critical ecoregions: the humid forest lowlands of the Chocó - Darien, which extend from Panama to the Ecuadorian West, and the Northern Andean Mountain Forests. Approximately 880,000 people live in the proposed biosphere reserve. The Choco Andino de Pichincha area extends from the outer foothills of the western cordillera of the Andes to its inner foothills. The region encompasses two critical ecoregions: the humid moist forest of the Chocó - Darien, which extend from Panama to the Ecuadorian West, and the Northern Andean Mountain Forests. Natural fragmentation of the western moist forests has resulted in rapid evolution of new endemic species. Around 10,000 species of plants have been reported, of which about 2,500 are endemic. The region is considered a biodiversity hotspot gathering some 270 species of mammals, 210 reptiles, 200 birds species and 130 amphibians. 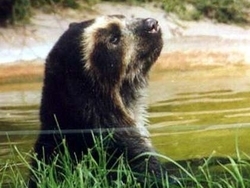 These include the spectacled bear (Tremarctos ornatus), Ecuadorian mantled howler (Alouatta palliata aequatorialis), pacarana (Dinomys branickii), olinguito (Bassaricyon neblina) as well as endemic species such as the Choco toucan (Ramphastos brevis), Pichincha rocket frog (Hyloxalus toachi) and speckle-faced parrot (Pionus tumultuosus). The area has a population of approximately 880,000 inhabitants. Main economic activities include retail trade and industrial manufacturing. The population is also engaged in agriculture, particularly the planting of fruit and vegetables, especially the cultivation of sugar cane in Pacto and Nanegal; fish farming, breeding of trout and tilapia; and livestock. Many archaeological sites of the Yumbo culture can be found in the area. The Yumbo built a lasting culture on the rich, volcanic mountainsides of the Pichincha Volcano, using their skills as farmers and merchants to become indispensable to neighboring tribes. Like many South American tribes, the Yumbo fell ill from diseases like smallpox and the population was heavily decimated in the first two decades after European colonization. But it wasn’t until 1660 that the Yumbo culture disappeared after the eruption of the Pichincha Volcano which left a thick layer of ash over Tulipe and the surrounding area.